14 Comments Creative Blogger Award! Into which orifice do I stick this? In the UK, where I come from, medicine is something you swallow. In Italy, you cannot leave the doctor’s surgery with a prescription in your hand before asking the immortal question, “Into which orifice do I stick this?” Seriously, it could be any one of them. Over the years I have been prescribed things to … More Into which orifice do I stick this? 12 Comments Into which orifice do I stick this? I took my son to a special exhibition of minerals owned by a private collector recently. He said this one looked just like Superman’s home, so it must be kryptonite: I was inclined to agree, but actually the label said it’s a kind of quartz. Sicily has a stunningly amazing range of mineral deposits. It … More Is Sicily the Most Geological Place on Earth? 9 Comments Is Sicily the Most Geological Place on Earth? 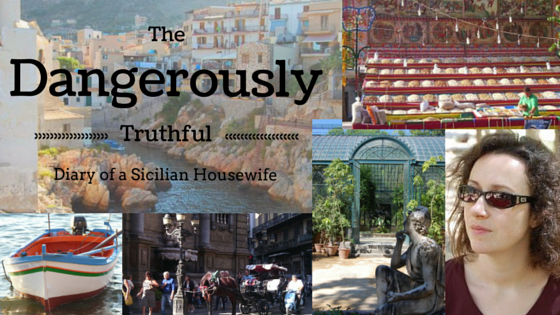 Today I am featured on the newly-launched travel blog of Jules Brown, author of The Rough Guide to Sicily. Italy Magazine Blogger Awards: I’m in the Finals! Ooh exciting! My dear friends, my blog is in the finals of the Italy Magazine “Best Living in Italy Blog.” If I win I might become rich and famous! 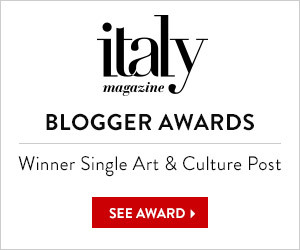 Blogger Awards 2015 I am also nominated for the “Best Living in Italy Single post” category, for my tips on how to handle Italian men (or ward them … More Italy Magazine Blogger Awards: I’m in the Finals! 40 Comments Italy Magazine Blogger Awards: I’m in the Finals! Mazel Tov! The Sicilian Housewife goes to Israel! Not really. I went to a “meeting” in the local council building to “discuss” the “promotion” of “tourism” in our town last night. All these “”””””” “”” ” ” “”” have a purpose and I promise to explain. Being an astute housewife, I realised very quickly that I had been lured there under false pretences … More Mazel Tov! The Sicilian Housewife goes to Israel! 24 Comments Mazel Tov! The Sicilian Housewife goes to Israel!